The Levada Women’s Choir and Orion Men’s Choir perform as individual choirs and as a Mixed Chorus, taking pride in being a model for choral excellence. 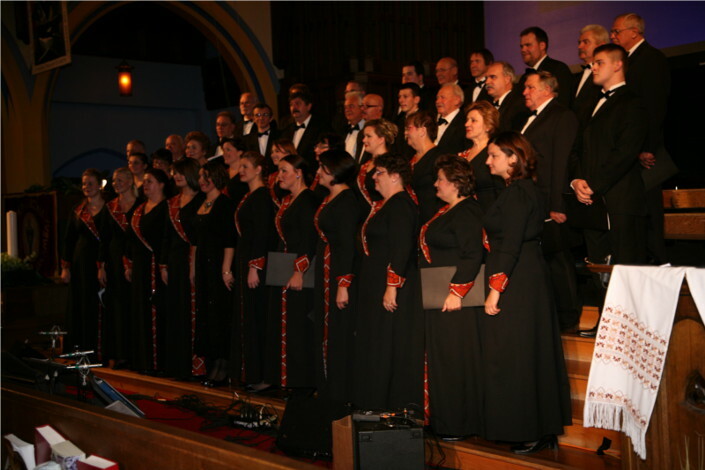 Some choral arrangements are accompanied by the Vanguard Concert Band to produce a unique and powerful musical experience. All members of this community-based choir are united by their love of choral music. Their wide-ranging repertoire includes: classical, contemporary, patriotic, traditional folk, sacred and liturgical. They look forward to new and challenging repertoire which attests to their desire for musical growth, artistic development and personal fulfillment. Cultivating a professional image is of the utmost importance as they perform in myriad venues. At present, the Levada Women’s Choir has 22 talented members, who enjoy cultivating many musical genres, and who are united by their deep sense of community, and by their strong connection to their heritage. 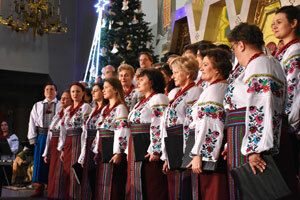 The Levada Choir performs choral repertoire especially arranged for women’s voices, which is sometimes accompanied by Ukraine’s national instrument, the bandura, which is said to be “the soul of Ukraine”. These musical gems, which showcase a unique artistic production, always receive a rapturous welcome. The Levada Women’s Choir has forged its own identity with the annual production of Easter and Spring Ritual Songs, also known as HAYIVKY. This musical presentation takes place on Easter Sunday at St. Mary’s Dormition Ukrainian Catholic Church in Mississauga. 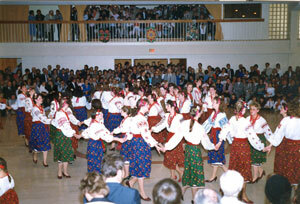 In the past, Hayivky have been performed in other venues: at St. Elias U.C.C. in Brampton, at Metro Hall in Toronto as part of the Toronto Folk Arts Council Easter Around The World, at the Mississauga Living Arts Centre and in various U.S. cities. The Levada Women’s Choir members are also required to participate in fundraisers, which builds esprit de corps and exemplifies camaraderie. The Christmas season is also known for Koliada (Carolling). The Levada Choir delivers the Christmas spirit by carolling in private homes, which above all is a great Ukrainian tradition! All choristers aspire to meet new challenges and to pursue choral excellence as they look forward to an exciting and promising future. The Levada Women's Choir is proud to be a member of Choirs Ontario. Choir members are expected to follow a code of conduct relating to attendance and punctuality, at rehearsals and performances, and fundraising, as specified in the orientation handbook. 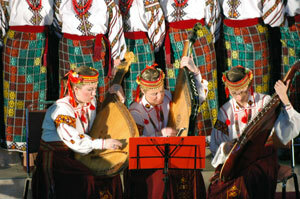 They must also meet expectations regarding costumes and notes which are the property of the Ukrainian Youth Ensembles. Mutual respect and friendship form the basis for a warm and inviting musical environment, where new members are always welcome. Rehearsals take place every Tuesday from 8:00 to 10:00 p.m., from September to June at 1222 Fewster Drive, Unit 3, Mississauga ON L4W 1A1 (Dixie & Eglinton). Additional rehearsals are added on Thursday and/or Sunday before a major performance. Summer rehearsals are sometimes required depending on community commitments. The Levada Women’s Choir has its own Executive which is elected by the Levada membership every two years. communicating with other choir executive members: Assistant Head, Secretary, Treasurer, Wardrobe Representative, Librarian, Staging/Make-up Representative.